We are offering Stainless Steel Sieve to our client. 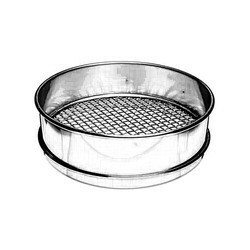 Test Sieves made up of Brass, Stainless Steel, GI. S.S. Pharma Equipments offers a range of Hand Sieves in SS 304 & SS 316 Quality, as per requirement. Specifications: All sizes, densities, weights, pieces per kilo, etc. - Coatings: Thermo-stat, anti-skid, colors, etc. - Branding: Stickers, etching, embossing, etc. - Packaging: Corrugated boxes, display boxes, gunny bags, etc. - Shipping: Air freight, ship, partial/full container load, etc. We have carved niche in the market by offering Stainless Steel. Professionals make these products employing the quality assured material keeping in mind the set values of industry. 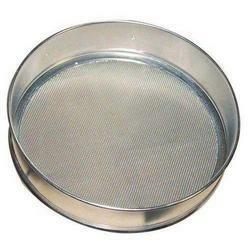 We are manufacturer & supplier of Anti Static Dissipative Sifter Sieves. Usage: TO FILTER FLOUR SUCH AS "ATTA, MAIDA, ETC." ALSO GRAINS SUCH AS WHEAT, RICE, BAJRI, ETC.